Graphics with the simple message "Boys are perfect." Thank you, Mommy and Daddy, for researching the foreskin and leaving it be, attached to ME! 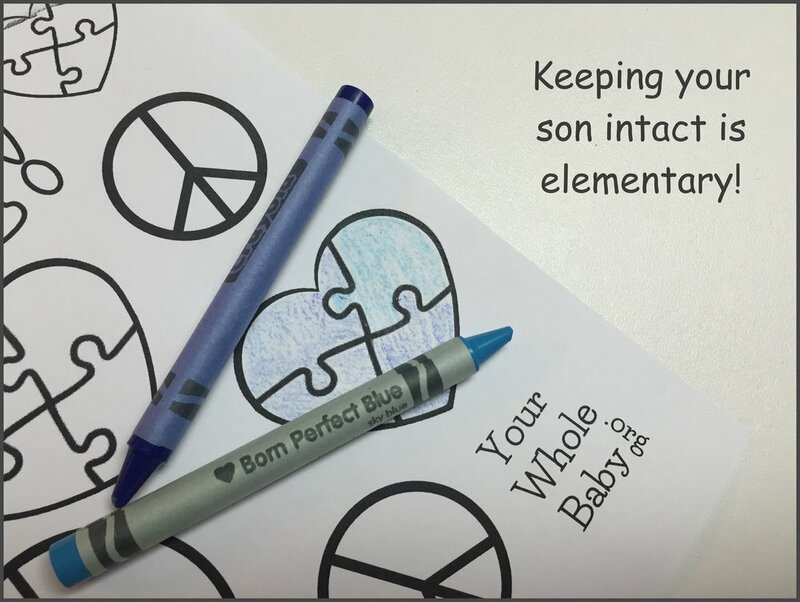 Keeping your son intact is elementary! ...baby I was born this way! Nature must have put a foreskin on every human male for a reason. No matter how many are cut away, every infant boy continues to be born with one. What is Mother nature trying to tell us? Keeping your baby intact is no more a decision than "deciding" not to cut off his fingers at birth. Dad's choice is not being ignored in favour of yours. Your "choice" is not your choice; it is your son's natural form. Leave him in his default state. Bring him home whole. No decision making necessary. Your body is perfect; it grew a baby for nine months. His body is perfect; it took nine months to complete. Boys are born perfect too. You don't want to mess with me, Doc! No one is cutting off a part of my healthy body. "one, two, three, four, five." You counted each finger and toe to make sure that all of his body parts were there. Why permanently remove another? Bring your whole baby home.